Gougères are crisp rounds of choux pastry flavored with cheese. There are many variations, from the type of cheese used, to adding extra ingredients such as finely chopped chives (or green onions) and cooked bacon. They make a delicious hors d'oeuvre but I also like to serve them with soups and stews. Some say the choux pastry shells look like small cabbages which is probably where the name "choux" comes from, as "choux" in French means "cabbage". Catherine de Medici's (an Italian who married France's Henry II) pastry chef is credited with inventing choux pastry in the 1540s and it has been the springboard for many pastries. Besides Gougères, choux pastry is used to make Cream Puffs (choux pastry filled with whipped cream or pastry cream), Eclairs (long finger-shaped choux pastry filled with cream and glazed with chocolate), and Profiteroles (small puffs of choux pastry split and filled with whipped cream or ice cream and topped with chocolate sauce). Choux pastry is an unusual pastry in that it is first cooked on the stove and then baked in the oven. It is made by adding flour to a boiled mixture of butter and water/milk (like a roux). After removing from the heat, the dough is cooled to lukewarm, and then you add enough beaten egg to get a smooth thick paste-like dough. Lastly, grated cheese (Gruyere, Parmesan, Cheddar, or Asiago are excellent choices), finely chopped chives (or green onions), and, if you like, bits of bacon are added. The mounds of choux can be either piped or spooned onto a parchment-lined or lightly oiled baking sheet. The pastry is first baked at a high temperature and then the oven temperature is lowered. The high temperature is needed so the dough will rise quickly (leaving a hollow center) and to set the structure of the shells. The temperature is then reduced to allow the outsides of the shells to become golden brown, firm and crisp, while at the same time allowing the insides of the shells to dry out. You might want to cut one of the shells in half at the end of baking to make sure they have dried out, because if the inside dough is still very wet (a little wet dough is fine), the choux pastry will deflate upon cooling. Choux Pastry: Preheat your oven to 375 degrees F (190 degrees C) and place rack in center of oven. Line a baking sheet with parchment paper or lightly butter or spray the pan with a non stick vegetable spray. In a bowl sift or whisk the flour. Put the butter, sugar, salt, water, and milk in a heavy bottomed saucepan. Place over medium high heat, and bring to a boil. (Make sure that the butter melts before the water boils to reduce the amount of evaporation.) Remove from heat and, with a wooden spoon or heatproof spatula, add all the flour and stir until combined. Return the saucepan to the heat and, stirring constantly, cook over low heat until the dough comes away from the sides of the pan and forms a thick smooth ball (about 1-2 minutes). Transfer the dough to your electric stand mixer, fitted with the paddle attachment (or use a hand mixer), and beat on low speed to release the steam from the dough (about a minute). Once the dough is lukewarm, add about 3/4 of the lightly beaten eggs (dough will separate and then come together) and continue to mix, on low speed, until you have a smooth thick paste (dough will fall from a spoon in a non-ragged "V" shape). (See video for demonstration.) If necessary, add more beaten egg until you get the correct consistency. Stir in the grated cheese, chives, and bacon (if using). Spoon (or use an ice cream scoop) or pipe 8 mounds of dough (about 3 tablespoons (45 grams)) onto the baking sheet, spacing about 3 inches (7.5 cm) apart. 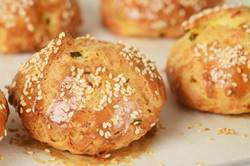 With a pastry brush, gently brush the mounds of dough with a lightly beaten egg and sprinkle with sesame seeds (if desired). Bake for 10 minutes and then reduce the oven temperature to 350 degrees F (180 degrees C). Continue to bake for a further 25 to 30 minutes or until the puffs are golden brown and when split, are almost dry inside. Note: The Gougères can be made and frozen before baking. To do this, place the unbaked Gougères (do not brush with the egg wash) on a baking sheet and place in the freezer. Once the Gougères are frozen, place in a sealed container or freezer bag and freeze for up to a month. The Gougères can be brushed with a beaten egg and baked directly from the freezer. You will need to add a few extra minutes to the baking time.